Fudge is actually so simple to make. I know a lot of people are intimidated by candy, but this is practically fool-proof. Another recipe that doesn’t require a candy thermometer and the hands-on time is less than 15 minutes! 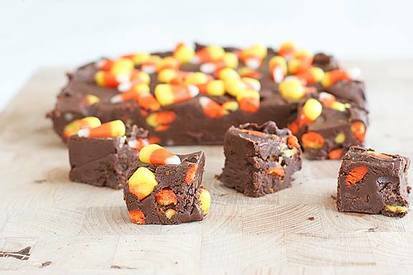 This is kind of hard to make pretty slices out of, just because the fudge is softer than the candy corn – but I’m sure no one would mind because it’s so delicious! So if you are looking for a way to be festive this season, Candy Corn Fudge just might be your answer! !